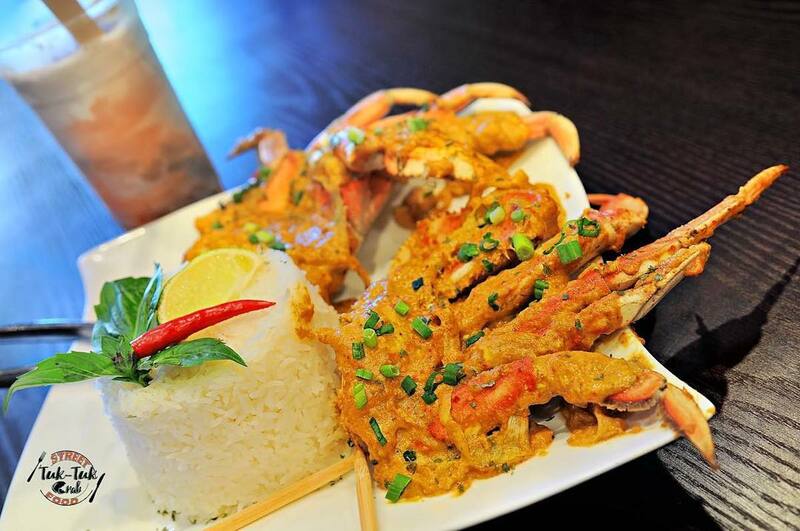 Recently opened Tuk Tuk Crab specializes in street food-inspired dishes from Thailand and The Philippines. Crab Curry is its signature dish. Photo by David with Dvisual Arts. Houston is no stranger to street food-inspired restaurants, but newcomer Tuk Tuk Crab pleasantly breaks the mold with a menu inspired by dishes from Thailand and the Philippines. Located at 6128 Wilcrest, the restaurant named for southeast Asia’s auto rickshaws opened in November 2017, providing an enviable neighborhood dining option for residents of both the International District and the nearby Energy Corridor. 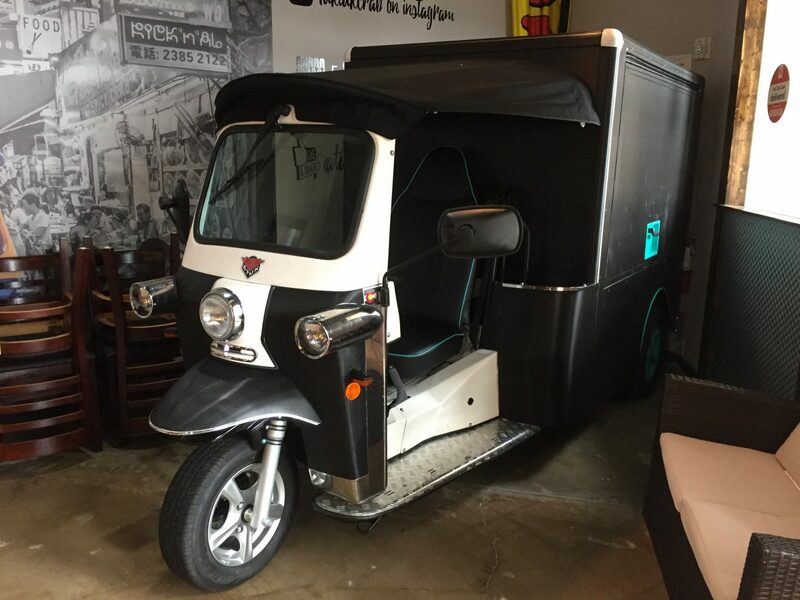 Named for the auto rickshaws popular in Southeast Asia, Tuk Tuk Crab features a real tuk tuk inside its clean and modern space. Photo by Lauren McDowell. The counter service format and the items on executive chef Francis Subida’s menu make the casual restaurant an excellent choice for friends and family who prefer to share dishes. This is especially true for Tuk Tuk’s signature dish—and Instagram star—the Curry Crab. When the plate arrives at the table in all its savory-sauced glory, it feels like a special occasion. Two sections of dungeness crab arrive covered in a coconut-based curry, with a neat, cylindrical stack of rice to help soak it up. Servers give diners plastic gloves and a claw cracker to facilitate the messy-but-delightful job of extracting the sweet crab meat beneath the shell. 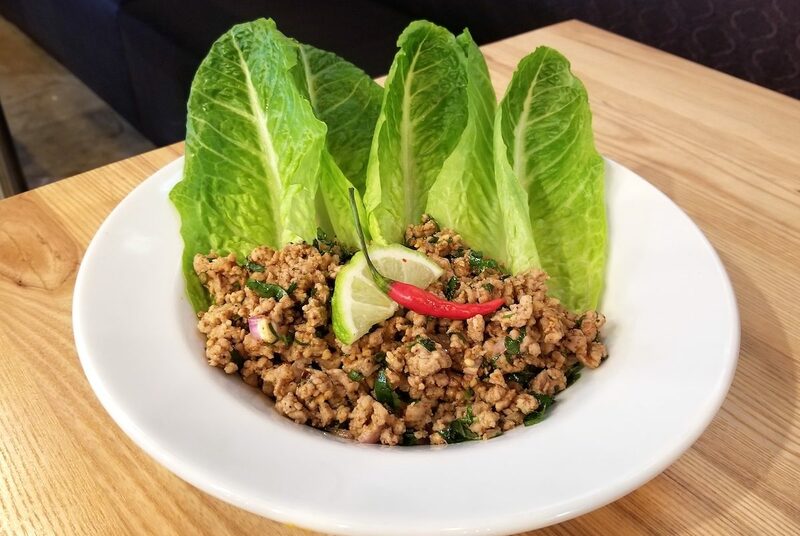 Tuk Tuk’s Laab Moo offers the restaurant’s take on Thai spicy pork salad, served lettuce wrap-style. Photo by Lauren McDowell. The majority of other offerings are less labor intensive, though happily no less complex in flavor. It’s worth noting that Tuk Tuk doesn’t claim to offer dishes exactly the way they’re prepared in their countries of origin, which gives Subida leeway to add his own touch to traditional dishes. An order of three Tod Mun Pla fried fish cakes were bright and briny, with a fresh kick of flavor from Makrut lime leaves. Served with sweet chili sauce, the combination of sweet, spicy and sour hits the balance of satisfying flavors that makes a Thai food craving. The Laab Moo is another slight deviation from tradition that riffs on larb, a traditional spicy pork Thai salad. Tuk Tuk sensibly reframes the dish as a lettuce wrap. Rather than the fiery spice and mint associated with the original, instead savory spice comes through with a smoky heat that doesn’t immediately require a cold sip of beer. Speaking of alcohol: Tuk Tuk is BYOB. Light beer and wine make excellent company for spicy-sweet items like Nuoc Mam chicken wings and dark, full-bodied beer is a good foil for Tuk Tuk’s Lechon Liempo, or Filipino-style pork belly with a tender middle and crispy exterior. The pork is cooked sous vide for 17 hours, and then baked for another five to six hours to achieve crispy, cracklin’ skin. Though the food is filling and likely to leave diners totally satiated, it’s hard to resist capping off the meal with Tuk Tuk’s Halo-Halo shaved ice dessert. Translated from Tagalog, halo-halo means “mix-mix,” which aptly describes a cup-based treat that feels like three desserts in one. In Tuk Tuk’s version, shaved ice is combined with evaporated milk, taro ice cream and mix-ins like coconut, mango, and gelatin cubes. Even after all of that, it’s then topped with housemade flan. The shaved ice alone makes a trip to the restaurant a worthwhile venture. Tuk Tuk Crab is open from 11 a.m. to 8:30 p.m. Tuesdays through Thursdays, 11 a.m. to 9 p.m. Fridays and Saturdays, and 11 a.m. to 8 p.m. on Sundays.